Well-being: If you are looking for a dopamine experience, come to the Place Jourdan in Brussels. The French artist Guillaume Bottazzi has created a soft, sensual and colourful artwork. It should bring you a feeling of well-being, and that has been scientifically proven. Sited in the European District, the 16 metre high painting is now on permanent display to the public. Guillaume Bottazzi has signed more than forty artworks in public spaces. He created the biggest painting in Japan (900 square meters) on all the walls of the Miyanomori International Museum of Art in Sapporo. The artist is also the author of 6 paintings, each one 6m x 6m, at La Défense in Paris, the largest open-air contemporary art space in France. The painting, which can be seen by the public at its location in the European District and which took two and a half months to produce, is already well-known. 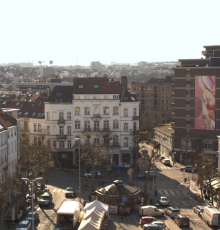 The monumental artwork, 16 metres by 7 metres, now belongs to the heritage of Brussels-Capital. The painting is one of the first abstract works to be painted in the manner of the Old Masters. The abstract nature of the work and the traditional techniques used to produce it create a feeling of strangeness, a dichotomy. The artist worked alone to produce the work, using fine brushes and oil paints. Successive transparent overlays give depth, diffuse light and softness to the colours. Before starting to paint, the artist installed a supporting structure that enabled him to reproduce as closely as possible the techniques of creation he uses in the workshop. The poetic dimension of this painting will extend throughout Place Jourdan: the colours of the painting will appear on the street furniture in particular, especially the cafe parasols. This project was carried out with the partnership of the European Commission in Belgium and support of the French Embassy.